GATE 2017 Scorecard: Aspirants who have appeared in the GATE 2017 exam which was conducted on 4th, 5th, 11th and 12th Feb 2017 can check their GATE Scorecard 2017 on the same day of the result declaration. 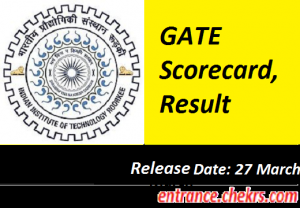 IIT Roorkee has declared that the GATE 2017 Result will be declared on 27th March 2017 its official website. Aspirants can download their GATE 2017 Score Card from 27th march 2017 to 26th May 2017. After this date, the aspirant has to pay Rs. 500 for the downloading of the score card. The scorecard will be published on the official website only there will be no scorecard or any exam related document will be sent via post to the candidate. The GATE 2017 scorecard will be generated on the official website on the day of declaration of GATE 2017 Result i.e. 27th March 2017. The GATE 2017 Scorecard is valid for only three years and aspirant can apply for the post-graduation courses only when the counselling process for GATE will be going on. The scorecard shows the marks and the rank obtained by the student. It is valid for all the colleges and institutes all over India. The PSUs will select the students only after showing this GATE Score Card Validity. Aspirants are advised to download the scorecard for free from the official website by 26th May 2017 after this date it will be available on the official website till 31st December with a fine of Rs.500. Aspirants have to access the GATE official site i.e. gate.iitr.ernet.in/. Then login into the GOAPS. Fill all the required information like Gate enrollment Number and password. The GATE 2017 Scorecard will be displayed on the screen. Aspirants have to download the scorecard by selecting the download link. Also take two print outs of the scorecard, one for admission purpose and one for PSUs. The GATE 2017 results will be declared on 27th March 2017 and the GATE 2017 scorecard will also be published on the day of result declaration. Students are advised to download the scorecard before 26th May 2017. After this date, a fine of Rs.500 will be charged and will be paid online through GOAPS for the downloading of the GATE 2017 Scorecard. For feedback and more queries regarding the GATE 2017 Scorecard, You can contact us by commenting the comment section given below.